Margs, tacos and the best view in San Diego! 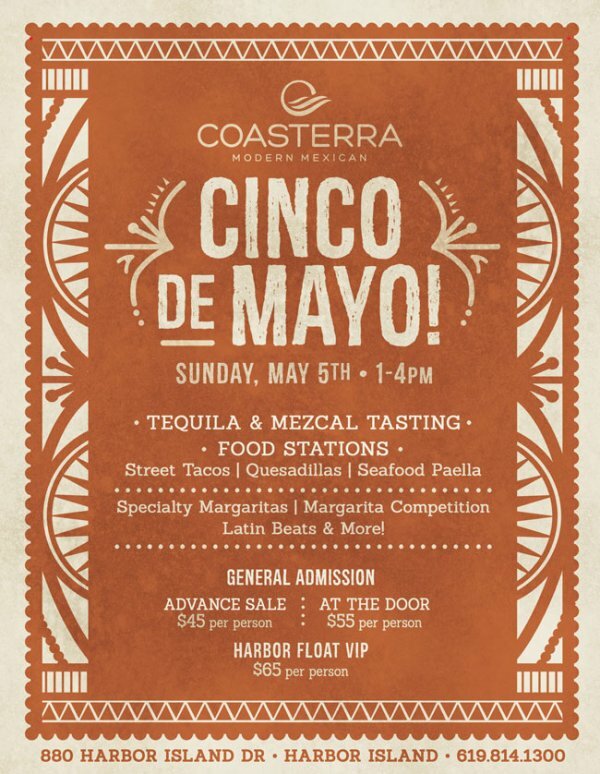 Join us at Coasterra on Sunday, May 5th from 1-4pm for our Cinco de Mayo Fiesta. General admission tickets include access to all food stations and one specialty margarita drink ticket. VIP tickets will have exclusive access to the El Tesoro VIP Lounge on Harbor Float which will include specialty tequila, baja wine and mexican beer tasting, limited lounge seating, raw bar, ceviche station and more! For more event information, please call Coasterra at 619-814-1300.